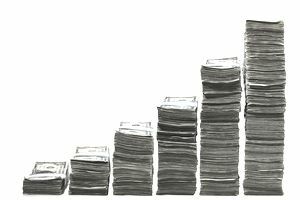 Although securities brokerage and wealth management firms have long since shunned the term "broker" in favor of "financial advisor" or something similar for their sales force, the phrase "broker payout grid" has persisted in common usage. In short, what is called the grid is the essential driver of financial advisor pay, especially in the traditional scenario of pay by commissions. Wall Street firms traditionally have treated their payout grids as business secrets. That last example illustrates the key feature of the payout grid, as it traditionally has been applied on Wall Street. By moving the financial advisor to the next level of the grid, one additional production credit (PC) led to a staggering $25,000.30 in additional pay. Herein lies a particularly powerful example of that double incentive to increase production alluded to above. Some firms have extensive exceptions to the grid, with sales of certain types of products given special payout rates. For example, a firm may give special incentives to sell in-house mutual funds, equity new issues that it underwrites, or securities of which it has excess inventory that it is eager to reduce for risk management purposes. These exceptions and bonuses can be permanent or temporary. Temporary sales bonuses traditionally have been referred to as "flavor of the month" promotions. The concept of offering special sales incentives for certain products, especially in-house products, has come under increasing fire since they can put the financial advisor's interests at odds with those of his or her clients. As a result, some firms have done away with such special incentives, and tout their "open architecture" approach that leaves the financial advisor undistracted in seeking the best investment vehicles for the client. Calls for securities firms and financial advisors to be subject to the more stringent fiduciary standard, as opposed to the looser suitability standard that traditionally has bound them, often have cited practices such as "flavor of the month" promotions as evidence that extreme reforms are necessary. Even when financial advisor pay is driven by transactions and production credits or commissions, rather than by an asset-based fee, most firms nonetheless supplement the payout grid with incentive pay for asset gathering. The strategic imperative is to have as much of a client's total financial assets as possible on deposit with the firm, whereby the firm is bound to maximize the revenues that it can earn from that client. See our discussion of the return on client assets or revenue velocity. Asset gathering awards typically are based on the net increase from year to year in the total assets in a financial advisor's client accounts. Some firms may adjust the asset gathering figure to reflect just the net deposits of new funds and securities to client accounts, removing the impact of fluctuations in value.